Don’t worry I am still here. OK, I admit it I havent posted properly for a little while, two weeks actually. The word “post” is not in my good books with me at the moment. Let me explain, I have had the past week off as holiday, and I do use that term “holiday” very loosely in this update. I have been promising to replace our broken fence for the last 2 years now. But, I have had important things to do since then, like do my Mustang up! But my wife loves her garden as much as I love my car, the fact her prized climbing Hydrangea were getting damaged due to the fence being broken as it was swaying more than front row of a Barry Manilow concert. When the wind blows, the fence moves and bits break of, I get it in the neck and I promise to fix it, then I go on the car. I have been getting plenty of subtle hints though, let me take you back to Christmas just gone. When I was asked what I wanted for Christmas the standard response is, “bits for my car” or “tools”. Come opening prezzie time at Christmas I got some car bits, brilliant. Snap On vouchers, awesome. Then I got given few extra goodies that “I may like!” given to me in order; All Fat Max tools, hammer (OK I can use that on the car), small spirit level (can’t see how I can use that on the car, check the stance of the car? Nice thought though). General purpose hand saw for wood, (definitely can’t use that on the car, but I can change it, I will have to be careful how I phrase it!) Fine toothed wood hand saw, (now I was wondering what was going on.) Then came a long heavy object, yes, a 1″ Snap On breaker bar, Nope, it was a massive sledge-hammer. Now I can’t use that on the car, then the penny started to drop with the final little prezzie gardening gloves. OK, I had been saying that I need a sledge hammer to break the old concreate, I need spirit levels for the posts, I need saws etc. Last Friday we, or should I say, “I” had delivered nine panels, eight concrete posts, one wood post and a gate, three trellis, oh and post mix. Great, not. Saturday I was greeted with “we can paint the panels before we put them up”. To be fair it was a nice(ish) day and we had a laugh. So Saturday was a write off. Sunday, Mark came round to help put up the fence. He’s a good man, he works hard and is better with a shovel than I am. Well I am getting on a bit now, that’s my excuse anyway. We had fun getting the old spikes out, trying to work around the plants that can’t be dug up or it will kill them and trying to avoid tree roots. Sunday was a write off. Monday, Mark came back to finish the last two panels with me. It didn’t take too long. (Thanks to Mark for help on the fence, grand job mate). That left me with a part fence to cut down and gravel board to fit in the space. Then we had to go into town, on the way back we got some door furniture for the gate. Monday was a write off. Tuesday was about cutting the trellis to fit inside the concrete posts and hang the gate. Tuesday was a write off. That evening the wife was printing out some lesson plans and my printer decided to produce a collection of drive rollers and cogs out the front with half the paper. This was greeted with panic as the lesson plans needed to be done. Wednesday morning we checked the net and found a printer we liked. So off we went to get it. We got to the store which was empty and we were pounced on like a lion that hadn’t been fed for a few days. I brushed them away and looked at the printer, not bad, but the replacement cartridges were only £10 cheaper than the poxy printer. Are the manufactures having a laugh or what? Do they fill the cartridges up with mermaid tears or what? Anyway, we found one we liked and took it home. 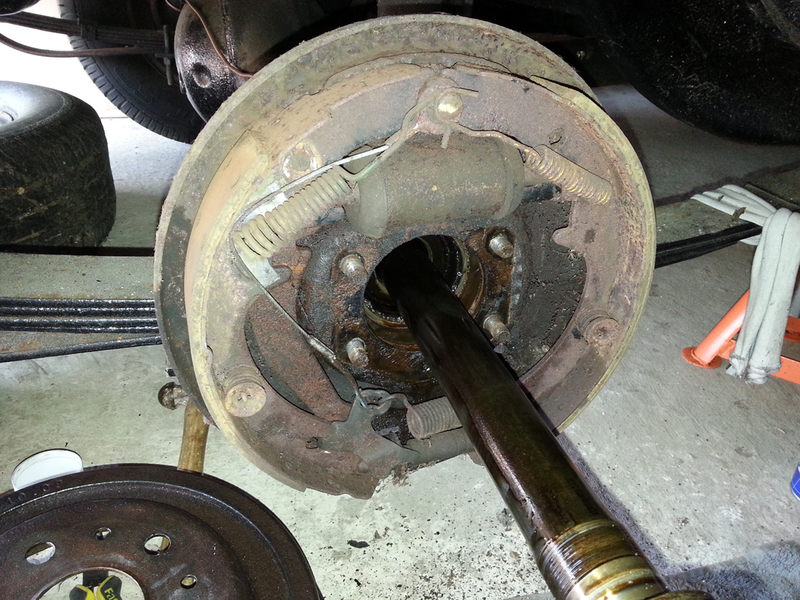 I went on the car when we got back to prep ready getting the drive shaft out and backing plate off for the brakes. Two hours later it was out and the brake plate as well. that evening the printer works well after a lengthy performance to set it up. Thursday I went to see Adam at Mustang Manic, I had a great laugh with him and got a complete hand brake kit for the car and a couple of drive shaft oil seals. A great day. Friday I spent all day cleaning up the plate and drive shaft with anti rust treatments. Great day. Today I put the backing plate and brakes together, put the drive shaft back in and got some of the Hand brake or Emergency Brake in place. Epic day. So as you can see I have been busy, the wife is pleased with her fence and has been in the garden pottering about. I have been on the car for the last couple of days and will be again tomorrow. I will post a photo set of the drive shaft and rear brake build. I have added a review of my Metal Works tap and die set, which can be found under the Tool Reviews or click here for a quick link. I will post again very soon. Heres a little teaser of what I have been up to! This entry was posted in Blog, General, Reviews and tagged backing plate, brakes, christmas, drive shaft, emergency brake, Fat Max, fence, hand brake, holiday, Hydrangea, Mermaid, Metal works, Mustang, Mustang Maniac, oil seal, printer, review, rust, sledge hammer, Snap-On, tap & die, tap and die, wife. Bookmark the permalink. If it helps…I’d much rather be behind the wheel of my Mustang than behind a vacuum cleaner. Don’t get me wrong, I clean the house as needed, but my preference is to wash my car over washing a load of laundry.